What: A groundbreaking ceremony for the New Family Justice Center courthouse for the Superior Court of Santa Clara County, in San Jose. Who: The ceremony will include remarks by California Chief Justice Tani G. Cantil-Sakauye, Santa Clara Presiding Judge Brian C. Walsh, Santa Clara Judge Richard J. Loftus, Jr., San Jose City Council Member Sam Liccardo and California State Senator Jim Beall. 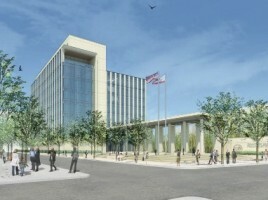 When: Tuesday, July 16, 2013, 1 p.m.
Why: The event commemorates the beginning of construction of the New Santa Clara Family Justice Center courthouse, the first new courthouse in the state to reach construction that is totally devoted to family law. The court’s new building will consolidate all family law operations and related services, currently dispersed in six facilities throughout San Jose, into a single centrally located building, significantly improving access and service to the public. The new eight-story building will include 20 courtrooms in 233,906 square feet. The facility will feature significant improvements in security, with separate hallways for the public, staff, and in-custody defendants, as well as better safety, and improved access and efficiency for visitors. The courthouse is designed to create a calming and stress-reducing environment, friendly to families and children. The new Family Justice Center courthouse is funded by trial court user fees pursuant to Senate Bill 1407, designed by Zimmer Gunsul Frasca, and constructed by Hensel Phelps Construction. Completion is scheduled for fall 2015. For more information, visit the California Courts website at http://courts.ca.gov/facilities-santaclara.htm. Members of the media wishing to attend the ceremony should contact Joseph Macaluso at 408-691-0046, for directions, parking information, and other background information.